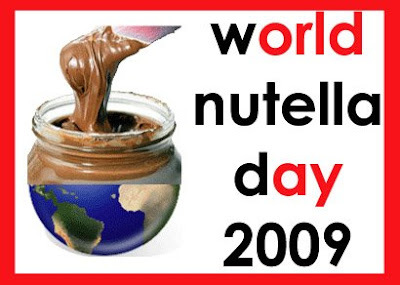 Vintage Victuals: Happy World Nutella Day! So I knew from the moment I discovered this wonderful holiday that I had to take part in it and celebrate. My first experience with Nutella took place while I was a high school exchange student in Nantes, France. My sweet exchange family - les Lorieux - were so wonderful to me and wanted to expose me to all of the wonders of French cuisine. For breakfast on one of my first days with them, they toasted thick slices of fresh brioche and smothered them with creamy, rich Nutella. That was it - I was in love! So I decided to come up with a fun and easy recipe involving Nutella that would be easy for all of my readers to make: Nutella Croissants! Dear readers, if you've ever seen the movie Sleepless in Seattle, you'll know why we call this combination MFEO - Nutella and croissants were Made For Each Other!!! They turned out to be soooo delicious - no surprise considering Nutella is involved. Flaky, tender, buttery croissants with that rich, gooey, hazelnut-chocolate pillow hidden on the inside. We had them for dessert, but they would also be a wonderful addition to brunch, or just a tea time snack! Open the tube of crescent rolls, and unroll and separate your triangles of dough. Place 1 heaping tablespoon full of Nutella at the base of each triangle. Bake for 14-16 minutes, or until golden brown. Enjoy this tasty treat, but don't burn your tongue on the Nutella!! This looks so delicious and easy. I love Nutella! I was thinking of trying something like this since i've never had nutella. Now I'm going to have to try it. Its looks great! OMG. i want about 53 of these right now. Oh my... I would love to start my morning with one of those babies and a cup of coffee!! These look amazing, I am drooling all over the place! :) Also, this is something I should probably be able to handle, right??? Haha. I just made these. So easy and so freakin yummy! Thank you for bringing these into my life. Now you tell me. Pillsbury just finished accepting recipes for the 2010 bakeoff. The crescent rolls were among the eligible ingredients. You could have added some chopped nuts for the second eligible product. Remember this for the 2112 contest. You may have a winner. WOW what a simply awesome idea! Chocolate is a girl's best friend! Blueberries, Bananas, and Oats - Oh My! Be Mine, Valentine . . .
By the Roads of VInes and Olives . . . The Joining of Two of My Passions . . .